Elfin Patch: Christmas Lull again. It is indeed the Christmas lull again, the bit between Christmas and the New Year. 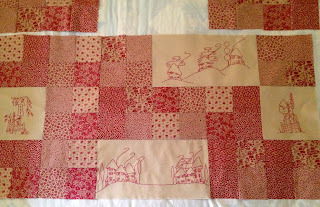 I have however, been busy doing the Redwork panels for the red Quilt, which I think I am going to call Elfin Way. I am very pleased with how it is going so far.The bottom half is pieced together and I have only two panels left to stitch and the top half will be finished. Then of course, the borders to think about. This is the penultimate panel being stitched, sorry the photos are not better. I can't get outside in natural light in this dreadful weather we are having, it's either blowing a hooley or peeing with rain. I join on some scrap fabric before stitching, to enable me to use an embroidery ring, when finished it is removed. My poor old garden is not looking good, and is in desperate need of some TLC, but will have to wait till the weather is a little better. I did manage to get out on the last fine day we had and trim the grape vine. The January appliqué block arrived today from the lovely Deborah Kemball, and it was a case of OMG again. Now I have said that every month since I started this BOM in October. The whole reason for doing this BOM was to improve my hand turned appliqué. Now is it doing that,? I am not sure but by the time I get to the last block, I do hope so. 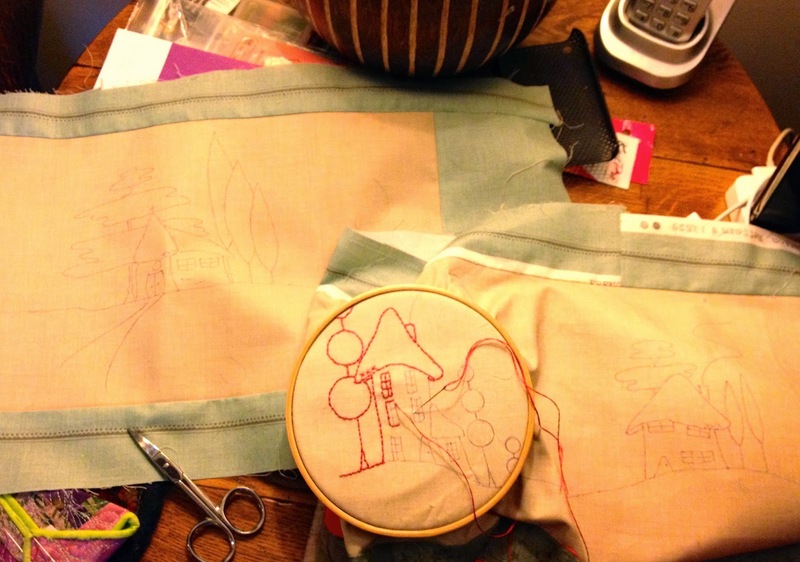 I now have plenty of hand stitching to be getting on with, while the weather is the pits.. I really like the redwork. 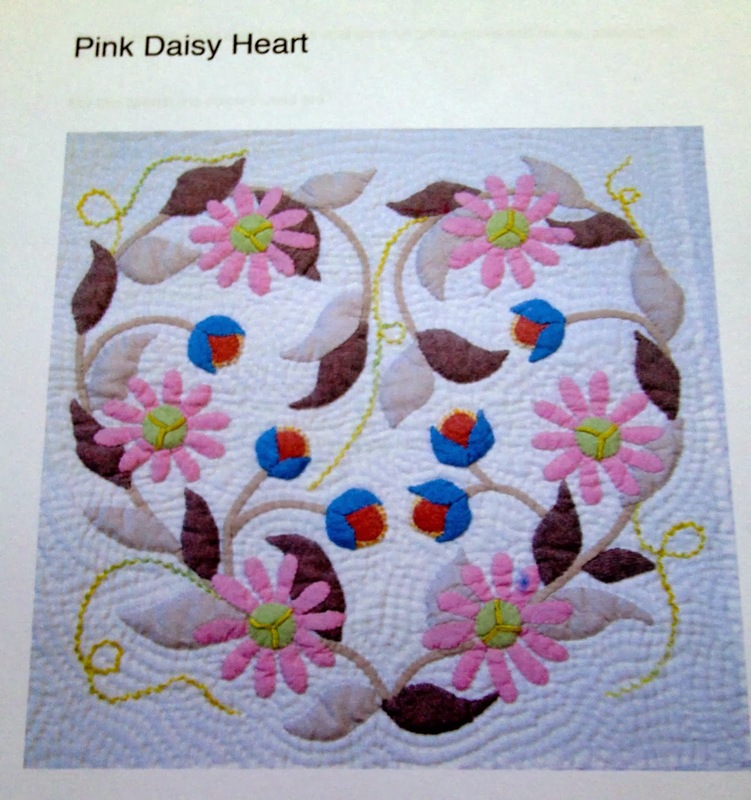 I like the embroidery and quilting together. I wish I had the patience to do that. 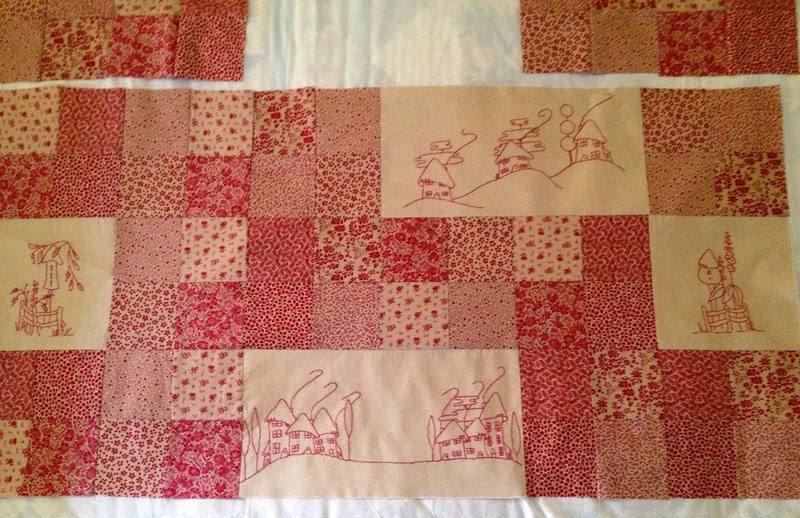 Your redwork is really lovely!